Astrophysicists recently detected another dwarf galaxy in the space between the Large and Small Magellanic clouds using the Dark Energy Camera. Astronomers detected evidence of the existence of another dwarf galaxy in the Milky Way’s neighborhood. Named Hydrus 1, the newly-found galaxy lies between the two Magellanic Clouds. Our galaxy is a monster of sorts. Its overwhelming gravity attacks its smaller neighbors. As we speak, The Milky Way is “eating” a pair of dwarf galaxies known by the name the Magellanic Clouds. 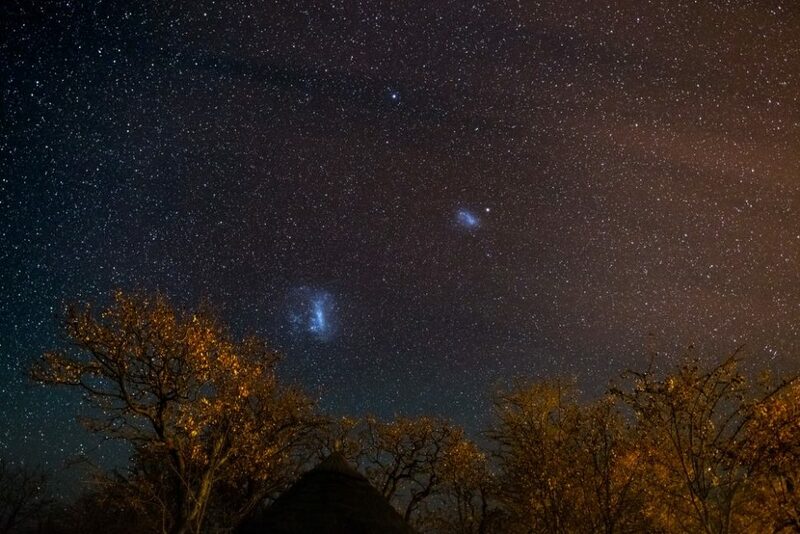 The two Magellanic Clouds both lie within approximately 200,000 light years from Earth and are visible from the Southern Hemisphere. To the unaided eye, they look like faint smudges in the night sky. Don’t let the attribute “dwarf” here mislead you. It would take a photon 3,500 years to cross the smaller of the two galaxies. This is huge, but The Milky Way has a 100,000-light-year diameter. At any rate, astronomers recently detected another dwarf galaxy in the space between the Large and Small Magellanic clouds. Using data from the Hubble Telescope, astronomers were able to find out which one exactly of these two dwarf galaxies is being devoured by the Milky Way. It turns out that the Leading Arm (aka the Magellanic Stream, a cloud of gas extending toward the Milky Way) originates from the Small Magellanic Cloud. Not only do the Magellanic Clouds interact with the gravitational pull of our galaxy as they orbit it, they also interact with each other. Other than the gas arm linking them to the Milky Way, the large and small Magellanic clouds (LMC and SMC), have a galactic bridge connecting them. Stretching over 75,000 light-years, the Magellanic Bridge (MBR) is a gaseous stream of neutral hydrogen that links the Magellanic Clouds. The MBR was first brought up in 1963, but scientists couldn’t detect evidence of its existence until very recently. Last year, astronomers spotted that there is a magnetic field associated with the Magellanic Bridge that could have formed due to the galactic tides between the LMC and SMC. There’s more on the galactic table for the Milky Way to feed on than astronomers first thought. An international research team has announced the discovery of a faint dwarf galaxy in the Magellanic Bridge. For their research, led by Carnegie Mellon University, scientists used data from a high-performance imaging instrument called DECam at the Cerro Tololo Inter-American Observatory’s Blanco Telescope in Chile. DECam (the Dark Energy Camera) was developed for the Dark Energy Survey project, but astronomers used it to detect a galaxy between the Magellanic Clouds. Located about 90,000 light years from the Sun, the newly-found galaxy was given the name Hydrus 1 because it lies in the Hydrus constellation. Described as “mildly elliptical and ultra-faint”, Hydrus 1 is thought to be a dwarf galaxy, though researchers don’t exclude the case of an extending globular cluster at this point. The team is unsure because dark matter seems to be dominant in Hydrus 1. The system could be a dwarf galaxy that lost some of its Dark Matter content, or a globular cluster (a collection of stars) with a small amount of Dark Matter. “Hydrus 1’s velocity dispersion indicates that the system is dark matter dominated, but its dynamical mass-to-light ratio M/L ∼ 66 is significantly smaller than typical for ultra-faint dwarfs at similar luminosity. The kinematics and spatial position of Hydrus~1 make it a very plausible member of the family of satellites brought into the Milky Way by the Magellanic Clouds,” said authors of the paper published on arXiv.com. What happens when a bigger galaxy starts eating The Milky Way?